After posting my video of the oddball Chinese pistol in the recent RIA auction, I received a number of emails from folks with similar sorts of guns. One was from a fellow named Leonardo, who ended up with an interesting Chinese creation courtesy of Fed Ord. About 20 years ago, they were selling really junky C96 Mauser pistols imported from China – they were so beaten up that Fed Ord was selling them in bags of 5, sight unseen and as-is for very little. Well, Leonardo decided to try his luck with two bags, figuring he could probably at least assemble one working gun from each bag. After several days soaking the guns in Marvel Mystery Oil to remove all the caked-on gunk, he found that he had 9 typical abused Broomhandles and one that was different. 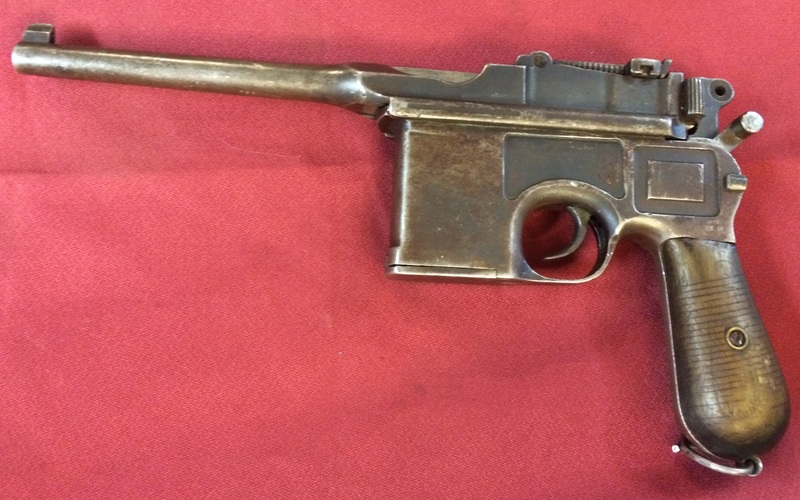 It seems that this particular pistol was originally made in Germany and shipped to China (as were so many) – but at some point the frame was rendered unusable. Maybe it broke, maybe it was hit by a bullet, maybe it rusted away, who knows. So, its Chinese owner had a new frame made for it, by hand. The frame on this pistol was made BY HAND. You can tell because of the tooling marks and the fact that the frame cut outs are all done by hand. Close inspection will show you that they are not straight and are not consistent. Also, several of the internal parts show the same type of material and work as well. The dead give away is the markings, total gibberish and nonsense. The metal is also a give away as the metal on the fabricated parts is slightly different and the patina on it is slightly different when you look closely at the pieces. Inside the frame the tooling marks are even cruder and easier to see that this was fabricated by hand and not machined much, if any. I have kept it even though many of my friends have told me that it is a piece of junk. Although I haven’t shot it, it is incredibly tight and all the parts seat on it just fine. The barrel, rear sight, bolt, extractor, magazine follower, trigger, and most of the internal pieces are original and they still retain the proof marks and original serial numbers. Interesting enough, the craftsman that made the frame and other pieces went out of his way to copy the frame exactly – down to the stock connection (which works but is super tight) and the serial numbers. One of my sons nicknamed the pistol “Micky Mauser” which I think is quite accurate. Usual mode of receiver failure in Chinese Broomhandles is grip frame corrosion. Salts from sweaty hands just eat up the thin metal on which the grips are mounted. Quite a few detachable stock carbines have been made from Broomhandles with rotted gripframes. I remember those days as well. Like you, I incorrectly assumed that the supply was inexhaustible. I did pick up a like-new .45 Shansi “Box Cannon” back in those days and still have it in one of the safes. Indeed, there was a whole cottage industry built around those “boat anchor” broomhandles. I wonder how many more unusual examples got tossed out as junk. Some of the lettering on the right rear of the frame looks either Cyrillic or someone’s attempt to “duplicate” Cyrillic. I’m wondering if the workman who made the frame wasn’t using a Russian-sourced “Bolo” Mauser as a pattern. “Mickey Mauser”–that’s great, a bon mot I will surely be looking for a chance to use, myself. I’m not sure how to explain China’s strong liking for the Broomhandle, but the preference is clear in numbers purchased, copies purchased (Astra etc. ), locally made look-alikes and this painstaking recreation by hand. It had to do with treaties following the 1900 Boxer rebellion. Foreign nations agreed not to sell serious military weapons (like rifles and machine guns) to China except for quantities that could be verified as going to the relatively small army of the central government. 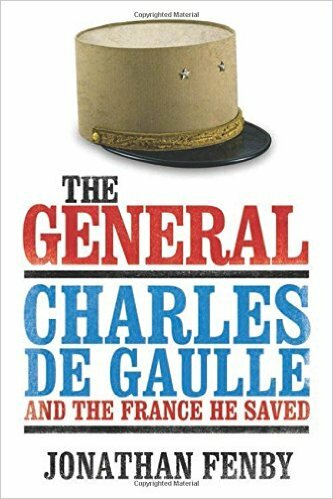 In effect, the various “governors” (actually warlords) and their private armies were embargoed. But due to a loophole in the agreement, pistols were defined as “police weapons”, and were not restricted in type or quantity. 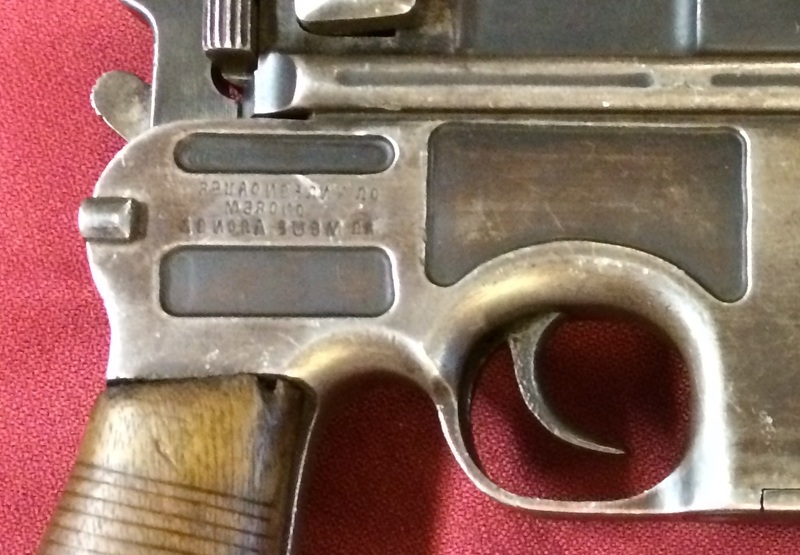 The Mauser-made Broomhandle was actually a relatively late arrival. The various Spanish gunmakers were there first, notably with their various Broomhandle knockoffs made starting in the early 1920s. The Royal and Azul brand Mauser copies were the first actual selective-fire “Broomhandles”, predating the Mauser Model 711/712 series by almost two years 91930-31 as opposed to 1932-33). With the stock/holster attached, the Broomhandle, “authentic” or copy, made a reasonable substitute for a rifle or carbine out to about 100-150 meters, due to its high muzzle velocity and flat trajectory compared to other pistols of its day. Plus it had a ten-shot magazine, twice the capacity of most bolt-action rifles. Some, like the Astra 903, had integral 20-shot magazines (and a leather “extension” on the stock/holster to protect same). One nasty trick with the “Schnellfeuer” (Mauser or knockoff) that was used by Chinese troops was to hold it on its side at waist level, with the off hand around the front of the magazine. When they pulled the trigger on full-auto, the Mauser’s tendency to climb was directed sideways, sweeping the spray of slugs across the target area. A lethal tactic against an infantry section out to 50 meters or so. Speaking of “home-grown” Mauser copies, one shown by Minnery & Truby on p.96 of Improvised Modified Firearms Vol 1., is noteworthy. 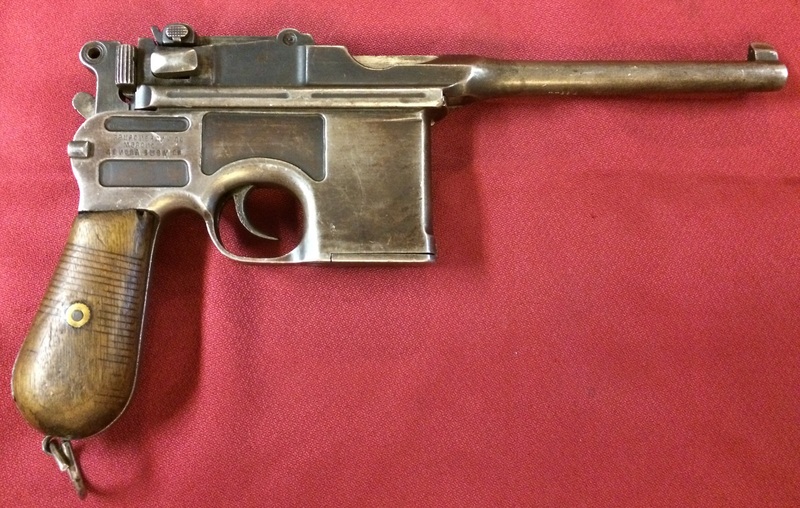 Credited to R.L Herrmann, and listed as “Asiatic copy of Mauser Broomhandle”, it was a single-shot, tip-down pistol made to look (more or less) like a Broomhandle. The “tangent sight” is actually the barrel latch. It looks only vaguely like a Mauser, practically like a wooden toy carved for a child. It probably wasn’t even rifled. But I’m pretty sure it could fire at least one shot, and sometimes that’s enough. I see…potential usefulness as a pseudo-carbine or SMG would be an incentive to choose the Mauser over some more convenient and better handling pistols. Sort of the reverse of laws I’m accustomed to, which attempt to make pistols harder to get than long guns. Makes sense; thanks. 1. Use of Broomhandle as an SMG was limited by its relatively thin barrel which would get over-heated after a short burst – and the barrel would not be cooled by the air-flow, since it was shooting from the locked barrel. 2. I was given to understand that BOLO C-93 was not manufactured by Russians, but FOR the Russians by the Germans (who also named it). I wonder how many similar guns evaded the round up efforts of the party cadres and are still treasured secret heirlooms? I think it should be pointed out that the treaties following the Boxer rebellion were placed upon the Qing dynasty (China’s last Dynasty-ruled by the Manchu). The reigning Emperor (who was a child) was really a puppet to a woman named Cixi. Cixi herself was actually quite responsible for hindering modern advances in China’s various potential industries, one example includes persecuting a group of reformers led by Kang Youwei and Liang Qichao(both men were forced to flee to Japan). Cixi even decided to back the “Boxers” believing they could expel the foreigners who were in and exploiting China (you know the whole opium thing). All of this would come crashing down, leading to the rise of the warlords, the founding of the Republic of China, the Northern Expedition, attempts to get rid of the Chinese Communists(who Stalin was backing both financially and militarily), Invasion by Japan, Chinese civil war, the founding of the People’s Republic of China, and the Republic of China’s retreat to Taiwan. In spite of the less-precise hand finish you had mentioned ( cut-outs that are not as straight-edged as the factory-made ones, etc. ), what intrigues me is that you did also state that the actual fit-up was very tightly-toleranced, more so than with the original. Please correct me if I am wrong, I also get the impression that the dry mechanical function ( without firing live ammunition ) seems to be fine. If you can determine that the hand-made replacement frame is of the correct grade of ordnance steel, it would seem that all these factors collectively add up to a functional, firing weapon. 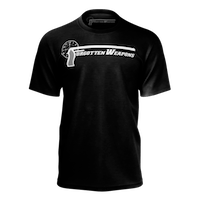 Not trying to encourage you to try it with live ammunition, of course, unless you personally have full confidence in the gun and choose to do so ; just tossing some ideas out there based on the available information so far. Neat thing about China is that there really was no *true* interwar period, just a jigsaw puzzle of on-again, off-again regional violence. I’m marveling that these things were stored for 50 years and taking it as further proof that almost almost everything about Chinese officialdom into the 90s was done on the Stalin-era Soviet model. In this case, it has to have been that all weapons they swept up from warlord forces in the 40s were mothballed forever for the People’s Militias, a sort of territorial army. These things are pretty fascinating. Gotta say, Mickey Mauser is one hell of a great nickname. It is unfair and untrue to characterize all of the China imports of the 80s as boat anchors, and Federal was only one of the importers. A collector back then I brought several, some in select condition. as well as several in ‘boat anchor’ condition. I still have one of the select condition ones with all matching numbers, what appears to be original bluing turned patina, a shiny barrel, and I have shot it fairly often with no problems. Similar with the Inglis pistols that came in around the same time. Some were abused, some were in almost brand new condition. You got what you paid for. There was a (jewish?) British comedian I remember reading about. Raised money and was part of Chang Kai Shek friends/entourage/commander? “Two Gun Cohen” I think/remember. Got the name after leading? shooting their group out of a fair attempt. Definite odd time and place. Raid capture attempt. Stupid correction not “fair” raid.